Absco Sheds - Who Has The Best Absco Sheds In The UK? Absco sheds have long been a market leader in their native Australia, and now they’re making a real impression here in the UK as well. There are few garden buildings as tough and practical as a metal shed, and Absco sheds are a prime example of them at their best. Built to withstand Australian storms, they’re very durable and wind proof, and they can cope with our British rain and snow as well. They also come with a patented ‘SnapTite’ assembly system that’s unique to Absco, which means that even their larger buildings are relatively quick and easy to assemble. 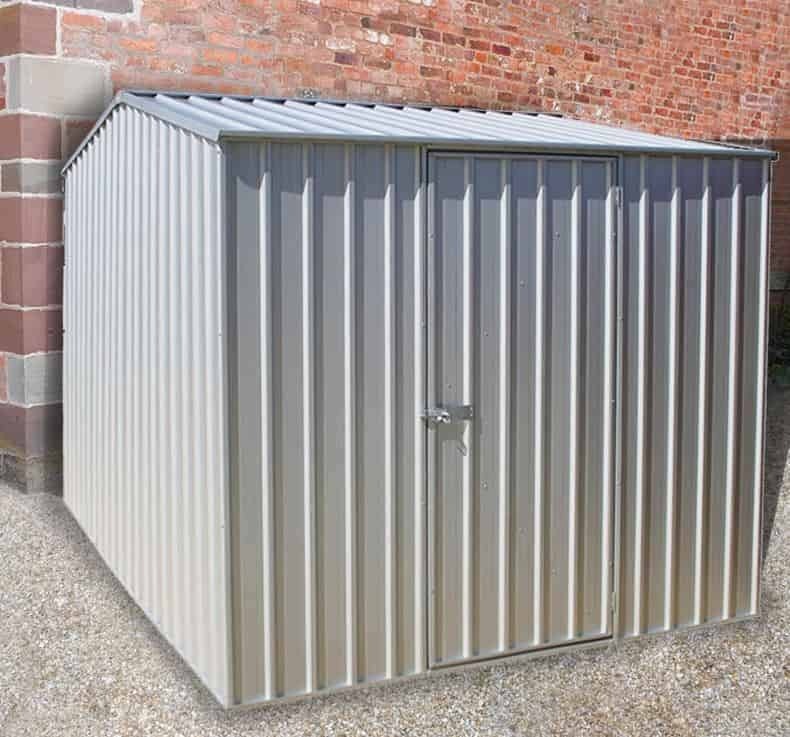 If you want to know where you can buy these great value metal sheds in this country, and which particular shed is best for you, then you’ll find the answers right here in our WhatShed guide to the top 10 Absco sheds for sale online in the UK today. One thing in common with all the Absco sheds featured in our league table is that they are all of the very highest quality, so separating them into a definite list was far from an easy task. We considered three things especially: price and value for money, storage size, and aesthetic appeal. 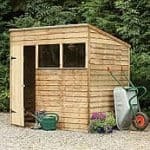 By looking at these factors, and others, we are now able to present this list of the WhatShed 10 best Absco sheds that are for sale online in the UK today. 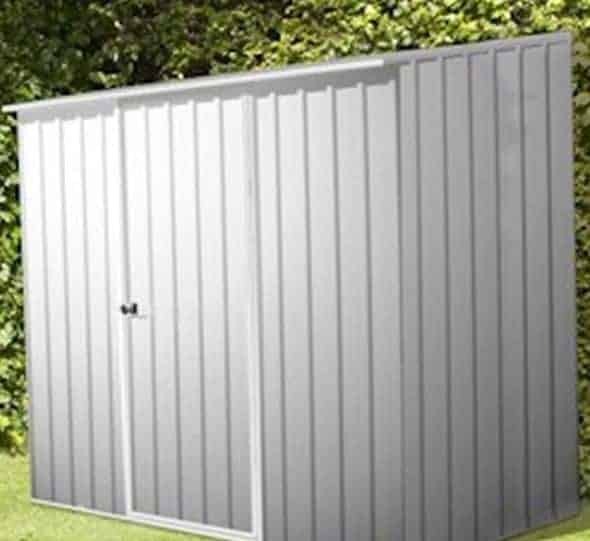 This list of the very best Absco sheds available in the UK was an extremely competitive one, as Absco show again and again that all of their metal sheds offer great features and good value. It’s particularly well done, however, to their large Titanium Easy Build Metal Garage which deservedly took the very top spot in our list of the 10 best Absco Sheds in the UK online market today. We look forward to seeing more sheds from this well established and respected Australian manufacturer, and of course at WhatShed we’ll keep on bringing you the in depth reviews that help you make a great choice whether you’re looking for a metal garage, secure shed, or any variety of garden building. Absco produce metal garden buildings in a range of styles and sizes, and to suit a range of budgets as well, and so we’ve taken this into account when producing our list of the 10 best Absco sheds that can be bought online in the UK today. Nevertheless, when we considered all its benefits together we found that the very best Absco metal shed of them all was also the largest. In fact, this is designed to be used as a garage, and has more than enough room to fit a family sized car and a scooter or motorbike inside. It’s size also makes it flexible, however, so we can also imagine it being used as a metal workshop for either business or leisure purposes. When we first saw this silver coloured building fully assembled we were struck by just how large and accommodating it is. The width is 3.00m and the depth is a more than useful 6.02m. It has a rain repelling apex roof as well and the peak height it gives is 2.06m. The double doors open to a width of 2.30m, so you won’t have to worry about scraping your car’s paintwork when driving in. One other feature we particularly liked was the single personnel door towards the end of a side panel, which is ideal if you want to use this building for dual purposes. 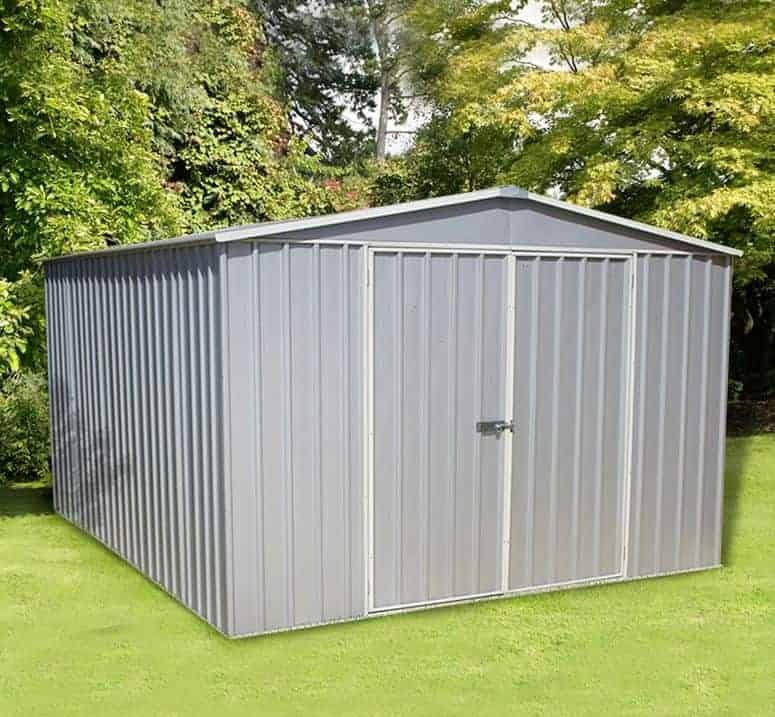 With a very large metal shed at a very reasonable price, this had to take the top spot in our league table of the top 10 Absco sheds. 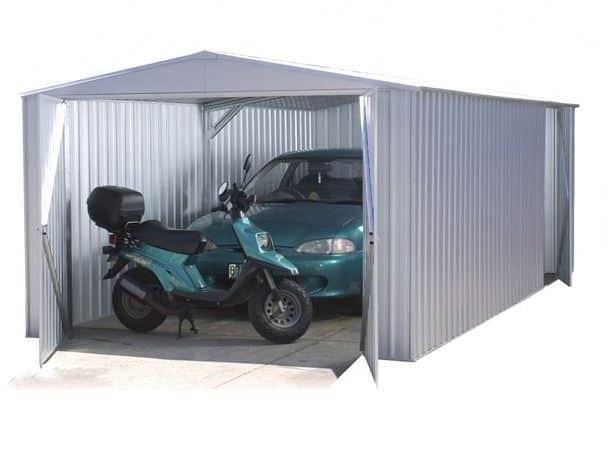 There really is something to suit everybody in our list of the very best Absco sheds currently available online, as shown by the largest and most expensive metal shed in the list taking the number one position, and then being followed by the smallest and least expensive at number two. The reason that we liked this compact garden building so much is that it’s now possible to have a very well built, very durable metal shed in your garden for a price tag of less than two hundred pounds. Like all the other metal buildings in this list, it also comes with a very long lasting 20 year warranty, which we feel adds even more value. Let’s take a look at the dimensions: this has a width of 1.52m and a depth of 0.78m. It has a pent roof, from which rain runs quickly and harmlessly away, that has a height at the back of 1.92m, and a height at the front of 1.80m. As these measurements show, it isn’t a building that’s designed to spend a lot of time in, but it is ideal for keen gardeners who are looking for a space to store their tools and equipment. A pad bolt is included but the addition of a lock can create a reassuringly safe storage environment. 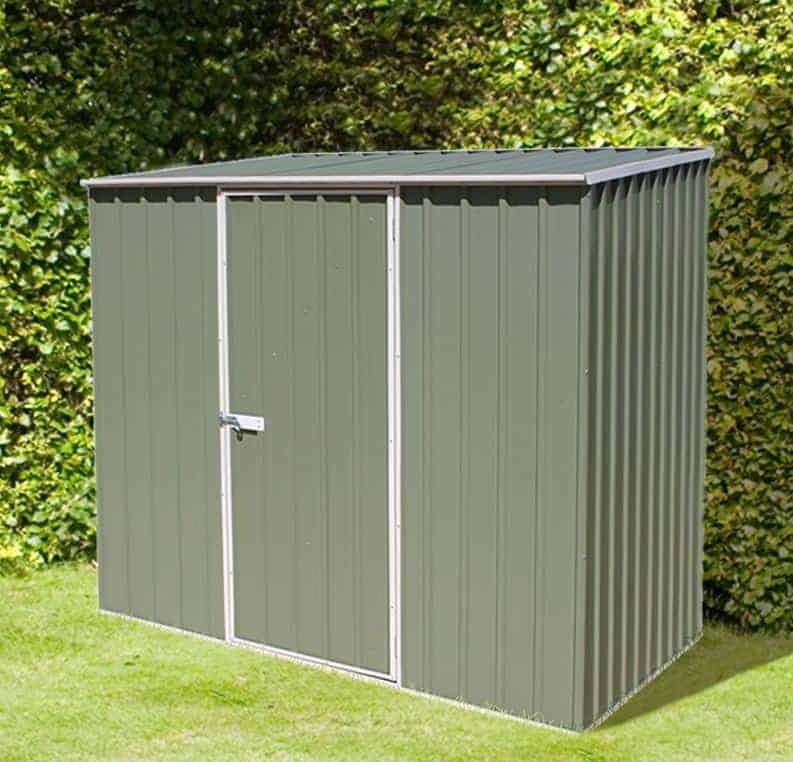 This model comes in a zinc colour, and thank to its outstanding value achieves a lofty position in our guide the very best Absco sheds. Unlike many of the other Absco sheds that we review, this has an apex roof which is not only good at channelling away rainwater, it also creates extra height. That’s a very useful commodity, as it means that there’s enough space to move around in. That creates extra versatility, meaning that the building can be used for much more than secure storage purposes. In fact, we can easily imagine it being used as a small scale workshop to carry out a hobby in, although as there are no windows, an artificial lighting source will of course need to be installed. 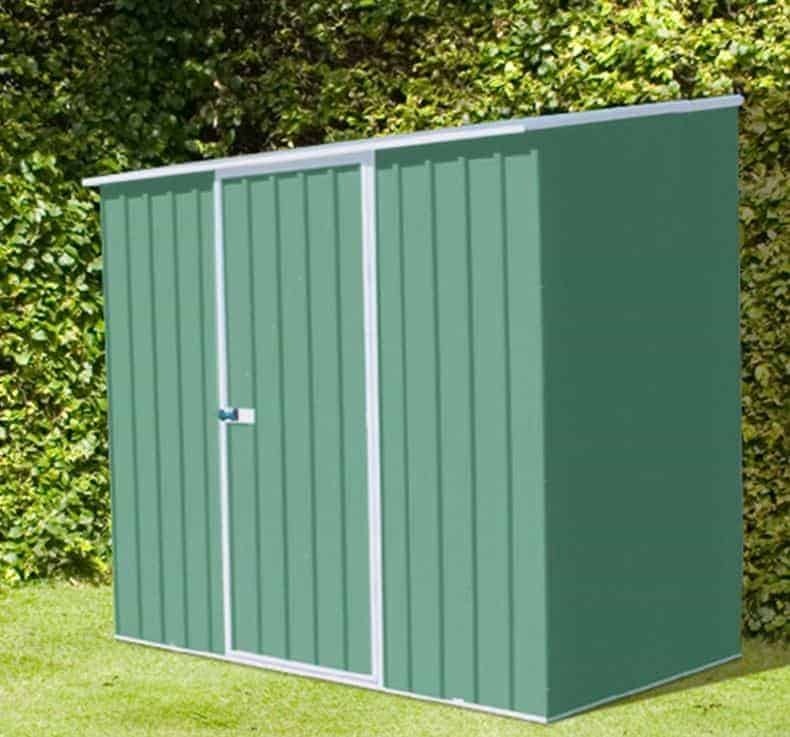 This is very much in the middle of the size range that we found when reviewing Absco sheds, but this means that it won’t take up too much room in your garden or look too obtrusive. The width of the building at 2.25m leads onto a depth of 3.00m, and there’s a strong hinged metal door in the middle of the front face. The building comes in a zincalume finish, which gives a silvery grey colour that looks very contemporary. We were very impressed by the asking price, and in fact it’s cheaper than some smaller buildings from the same manufacturer, which is why it makes it into our top three of the best Absco sheds that can be found online in the UK. This is another in the Absco range that comes in a zinc colour, but whilst we know that many people prefer metal buildings that look rather less silvery we still liked the sleek lines and strikingly simple design. It’s a very modern looking shed, and like all Absco sheds it offers some of the advantages that the very latest technology can bring. One of the principal advantages of the very strong galvanised steel used in the fabrication of this building is that it’s guaranteed to last at least 20 years, but having seen it we wouldn’t be surprised to see it last much longer. It has a pent roof that reaches a height of 2.06m, or six foot nine, and the base dimensions are 2.25 X 1.52m. This is more than adequate for most small to medium sized gardens, and the pent roof means that it doesn’t look too obtrusive. There’s also the option to buy stand alone shelving units which we thing would be a good addition, meaning that the owner can make the most of the vertical space available and keep the floor tidy and well organised, and therefore allowing them to get even more out of what we feel is one of the best value Absco sheds, coming as it does with a price tag of under three hundred pounds. This follows the same same dimensions of the number two entrant in our list of the top ten Absco sheds in the UK today, and yet it features slightly lower down the rankings as it costs 15% more. Nevertheless it does still represent very good value for money, and the one difference between the two buildings that is instantly noticeable is the colour scheme. This has a pale green vinyl cladding added to the tough galvanised steel. It means that it fits in very well with a traditional garden background, and will blend in nicely among trees and foliage. We can imagine many people paying a little more when compared to the zinc version for this reason. Once again then, with a 1.52 X 0.78 base area and a peak height on the pent roof of 1.92m, this is a very compact garden building. For many people, however, this will be an advantage rather than disadvantage. People with smaller gardens, where space is at a premium, can now enjoy all the benefits of having a secure storage area that a metal shed can bring. With a footprint of this size we can imagine it being used on a patio or balcony area, or even as storage in a caravan park. Because of their non flammable nature, Absco sheds comply with strict caravan park regulations, opening up even more opportunities for their usage. 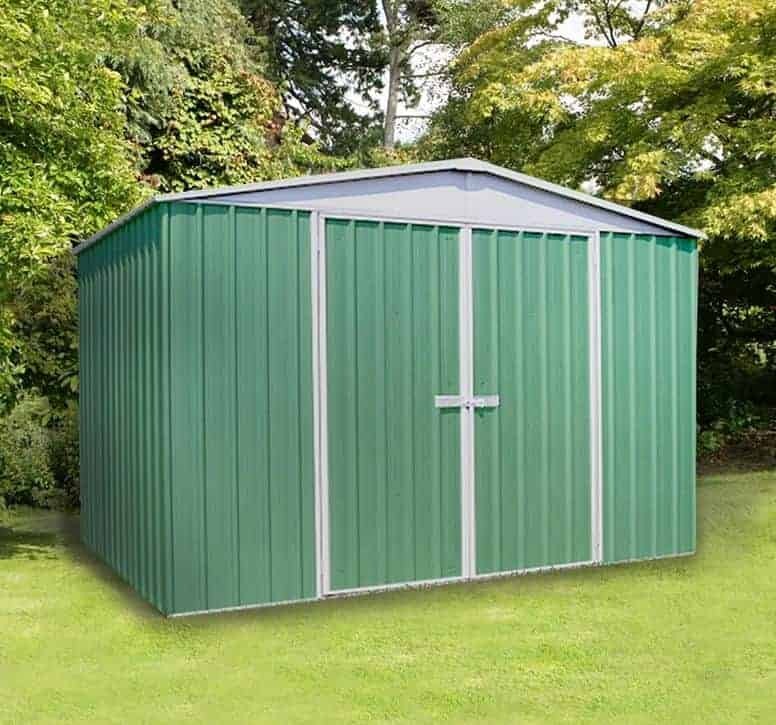 This particular metal shed from Absco shares the same depth as the one placed above it in our top ten list of the best Absco sheds, but it is noticeably wider at 2.25m. It also costs sixty pounds more, and whilst we still think that represents very good value for money, especially when the peace of mind bringing 20 year warranty is considered, this accounts for its relative positioning. One other thing it shares is the green colour scheme, officially called Eucalyptus in homage to the Brisbane roots of the manufacturer. Despite having the same attractive colour scheme and also having a pent roof which reaches up to the same height, it looks distinctly different to its smaller cousin, and that’s because it has a centrally positioned metal door rather than a side opening. We were pleased to see that the door itself is braced and padlockable, even though the lock itself has to be bought separately. As with all Absco sheds there are no windows, and this is in fact a great advantage where security is concerned as it means that passers by will be unable to see if anything of value is stored inside and it will therefore be less likely to be a target of shed thieves. This shares many of the characteristics that we find in Absco sheds, particularly of course with the metallic zinc version of this model that we placed in our Absco league table as it offered even better value than this very reasonably priced offering. There’s the familiar pent roof which is often used on the medium sized sheds such as this one, with a width of 2.25m and a depth of 1.52m, and the galvanised steel cladding arranged in a corrugated fashion. There’s a single hinged door in the centre, and at 0.75m wide it’s more accommodating than many of the single doors we see on other metal sheds we review. This is especially important and useful if you want to bring wide or tall objects in and out. Both the cladding and the roof are excellent at keeping rainwater out, so you won’t have to worry about protecting the contents. Because this model features the green eucalyptus cladding as well, allied to the tough and reliable galvanised steel underneath it, there’s no danger of rust occurring over time, and of course there won’t be any rotting, splitting, or insect or rodent attack. These are just some of the advantages that Absco sheds such as this bring when compared to traditional timber sheds, and if you like the minimalist yet attractively coloured design then this is a shed for your short list. This is a very large metal shed and whilst it is very reasonably priced when compared to similarly dimensioned sheds from other manufacturers, it still costs significantly more than many other Absco sheds; this is the only reason that it features towards the foot of our top ten league table, as it’s a sturdy garden building that has a lot going for it. The size of this metal shed certainly caught our eye, and yet even though it has a metallic grey colour it didn’t look obtrusive. Being made of strengthened steel it’s maintenance free, which will be a big relief to people who have become used to carrying out annual preservative treatments on large wooden sheds. The external width is 3.00m and the external depth is 3.66m, and on this occasion there’s an apex roof with a ridge height of 2.00m. There are centrally placed double doors that open out to a very generous 1.51m. For this reason, and the overall size, we can easily imagine it being used as a warehouse for a home operated business, although of course a padlock and maybe an alarm would need to be added. It looks very tough and strong, and its actions match its looks which make it a worthy entrant in the list of our top 10 Absco sheds. This is a very useful metal storage shed that provides excellent protection against the weather, for which it gains a 20 year warranty in common with other Absco sheds, and against the threat of theft with the inexpensive addition of a locking system to go with the padbolt we found here. What we particularly liked about it is that it’s approximately twice as wide as it is deep, with measurements of 3.00m and 1.52m respectively. 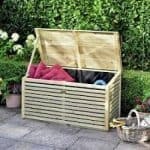 This makes it ideal for people who have shallower gardens but still want a tough and durable storage facility that offers a good amount of space without taking up too much of their lawn. 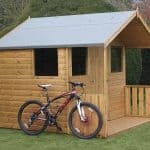 For this reason we feel that this shed is perfect for the storage of bicycles or even motorcycles. The steel used is fire resistant, which means that it’s a safe place to deposit a vehicle or even fuel and other flammable materials such as paint. We liked the pale green colour of the paintwork, so it’s also a good choice for people who like the idea of having a shed in their garden that’s maintenance free and yet don’t want something that looks too metallic. 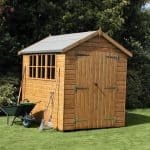 The only reason that this pent roofed and double doored shed only reaches the number nine spot in our list of the best Absco sheds is its price of nearly four hundred pounds, but even so we don’t feel it’s overpriced when compared to many of the sheds that we review. 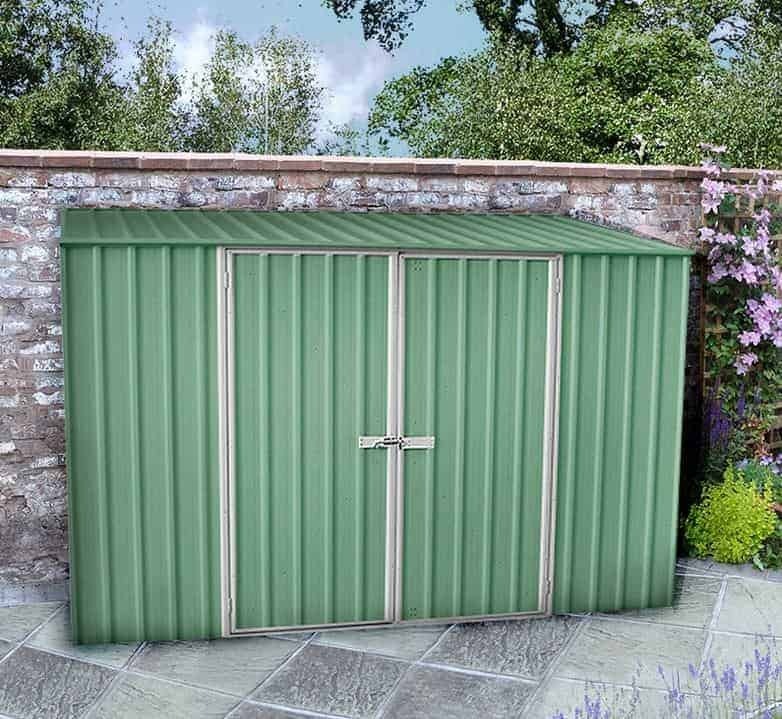 This is the one of two of the Absco Regent metal sheds to feature in our league table, and again it’s the higher price tag for the eucalyptus colour scheme, and therefore in our minds slightly less value for money, that sees it placed a little lower down. 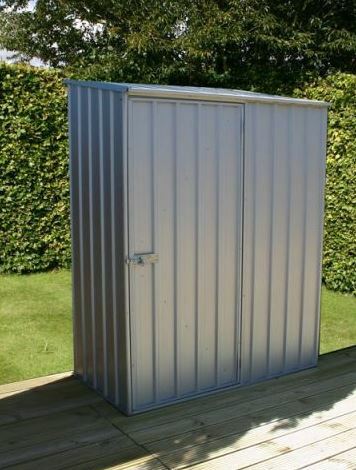 As before, this is a large and therefore very versatile metal shed and it offers nearly ten foot by twelve foot of storage space beneath the apex roof that the larger Abso sheds utilise. We have to mention here the special qualities of the cladding used on Absco sheds. The galvanised steel is very thick and solid, and has been tested to withstand the worst that Australian weather can throw at it. If you think that’s not relevant to the UK think again, as it means that it can withstand winds of more than 91mph. It’s great to have such reliable stability in a garden building of this size. Another feature in common with other Absco sheds is that it uses the unique SnapTite system. We think it’s one of the easiest assembly systems around, as the pieces have been machined perfectly and simply snap into a supporting frame. Even though this is at number ten in our league table, it’s still a fine offering for those whose budget is large enough. 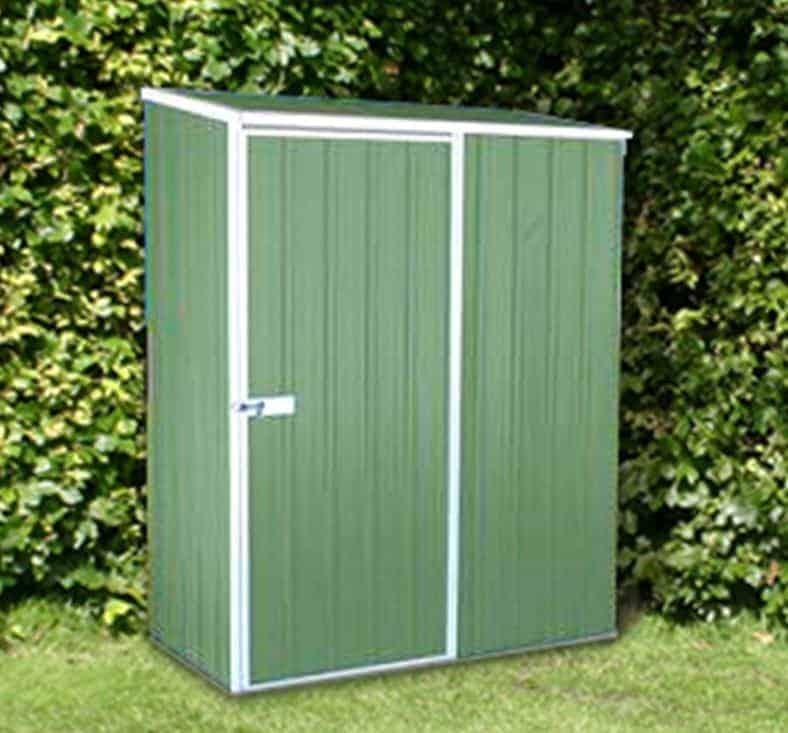 I am trying to buy a 10ft x 10ft absco metal shed , and can’t find one, can you help with this..? I have tried loads of sites and cant get one. I saw one on homebase at £239 , however they had none left and said they were discontinued, i’m not sure if they ment homebase or absco.? Had discontinued this shed..? Do you know..? Hi Tom, Absco are from Australia so in the UK supply can be a bit limited. 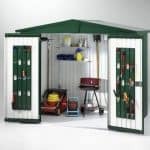 ShedStore typically have a good range of Absco sheds so you might want to check them out.